This country in focus note is part of the Statistics on Cooperatives series produced by COPAC and the International Labour Organization (ILO) in support of a larger initiative to increase understanding of the ways in which countries around the world are producing and using statistics on cooperatives. 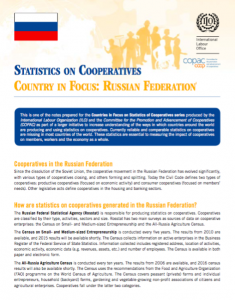 Currently reliable and comparable statistics on cooperatives are missing in most countries of the world. These statistics are essential to measuring the impact of cooperatives on members, workers and the economy as a whole.